I posted this as a pre-interest check in the Keycaps thread (https://geekhack.org/index.php?topic=94212.0), and there seems to be enough positive feedback to start a legit interest check. I was worried when SP said the weren't taking new orders for PBT SA, but the latest new is SP are getting new molds tooling put together and will be ready to take orders for SA PBT in about a month! 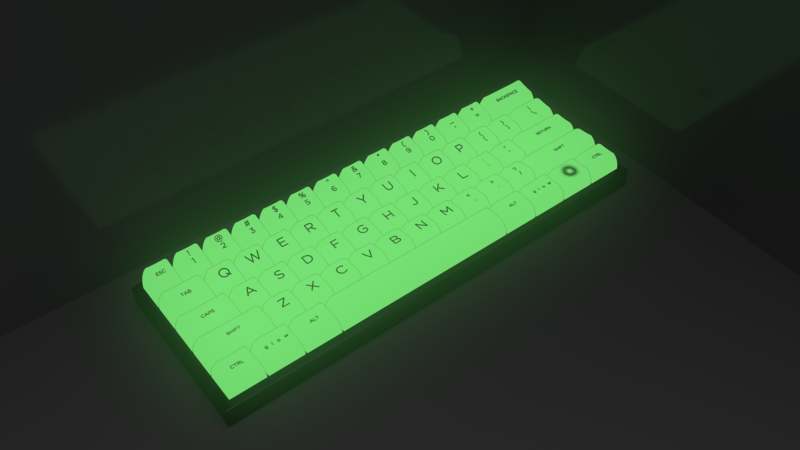 Preamble out of the way, this is the Glow SA keycap set! 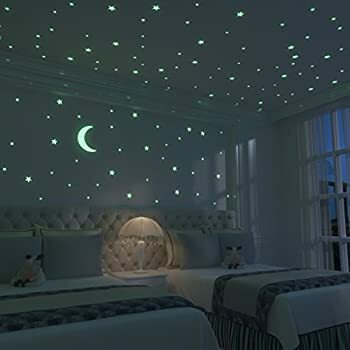 For your inner child, Glow-in-the-Dark anything is almost as good as the smell of a new He-Man action figure or the feel of those stretchy sticky hands. Also they look great with backlight with a nicely diffused glow that lasts even when you turn your keyboard lights off! During the day, a nice yellow/cream. A perfect accompaniment to whatever flavour of SA you're sporting. To keep things simple, I'm imagining keeping this two sets: 60% Base covers ANSI 60% boards in the usual fashion; 100% Upgrade bumps this up to the full 100% incl. F-row, numpad cluster, arrow cluster, and, maybe, some novelties (currently placeholders, thoughts and pics welcome if anyone has any suggestions). UPDATE: Kits are expanded following community feedback. Currently about 85% complete. Images below are the same set: with lights on, and in the dark. Colours are taken from pipette-sampling the web images, but having the Poison SA key on hand, they're pretty closely represented. Colouring is moot however - we all know what colour GitD is, and that colour is: AWESOME. UPDATE 2019-02-18: All-in prices are here! General progress announcement: There's a little bit of a delay on SP's end, the latest, as of this posting, is they're still a couple weeks away from having anything shareable on the new tool results and updated spec sheet. The waiting game continues. Let's keep this ball rolling, we'll get something solid to work with shortly! While we wait for SP to finalize their tooling and send out new spec sheets and get ready for price quoting, a minor update and housecleaning. Expecting more logistic information toward the end of April, in the meantime novelty progress and tidied up presentation. These are all the current ideas, not all will be used. Vote for your favourite and as always feel free to suggest anything you want to add. - Novelties are still being worked on, still looking for inspiration. - Extended ISO NORDE support isn't there yet - any specific requests for this? 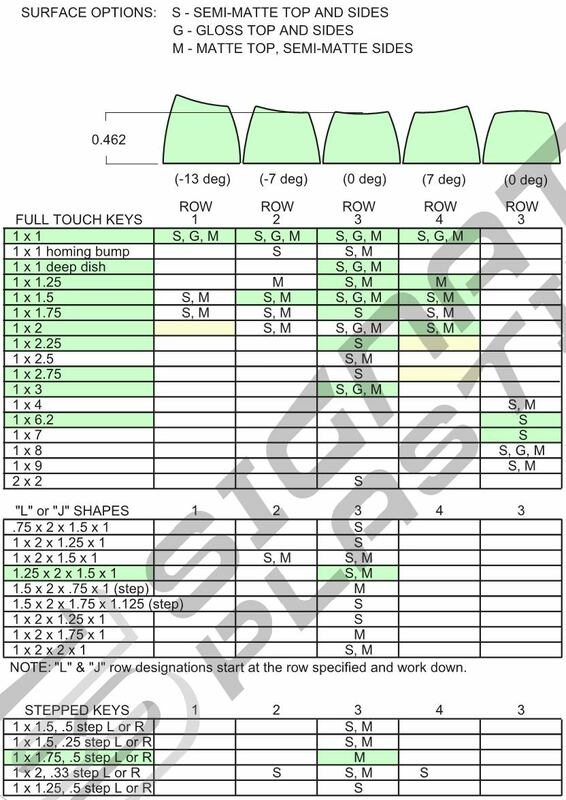 - Other than tweaking the kits and novelties a little, design will go slow down until SP can confirm their latest SA capabilities: not all keys are available on the preferred rows (see image below) which is being rectified by SP as we speak. Limiting to two kits makes life much easier for all involved, and it would need a really good argument for me to split further (feel free to try!). As much as I'd like to consider the more exotic Planck/Colevrak/Split options, this is not the set, not the first time around. Within this boundary condition, I'm open to suggestions. Any extra keys would be dumped into the 100% Upgrade set. So I'm putting this to the hive mind - any interest for Glow SA? Then hit "Change Profile" button on the bottom to finish. Thx! A: There sure will be, submit your requests and ideas, all thoughts that keep in the general g l o w theme welcome! 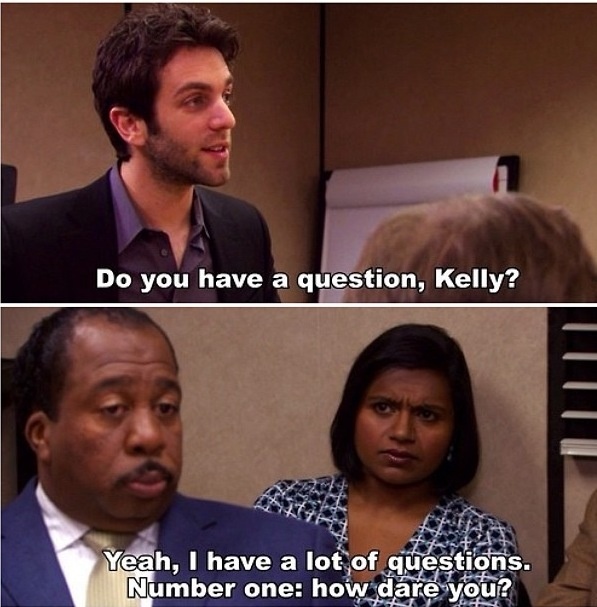 A: Nope, keeping it simple. A: Only SP seem to offer GitD, and SA is their best profile. 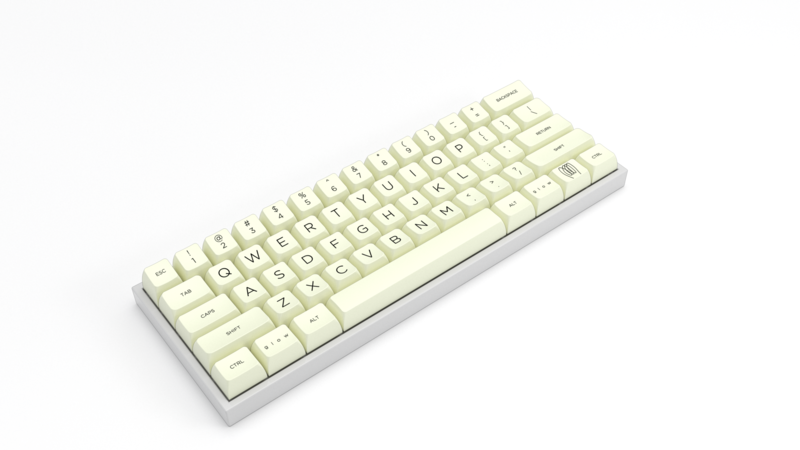 Q: When will the [GB] go live? A: We're waiting on SP to update their machines - this will be one of the first fully-profiled SA dye-sub sets so there is a little behind-the-scenes R&D and testing that needs to happen before then. Watch this space. 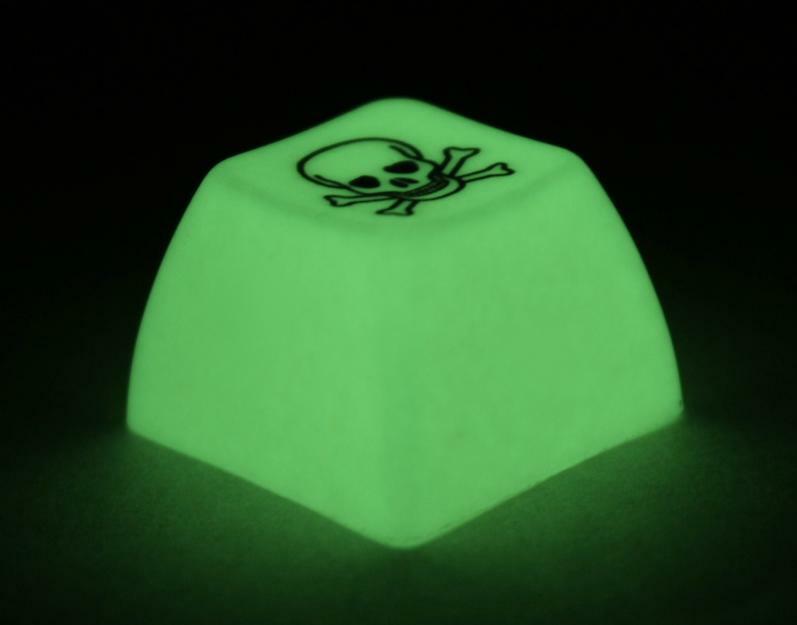 a fully Glow in the dark keyset, how unique and something I would not pass up. You got samoas out there on Oahu? Understandably no ISO and no 1/1.5u mods so this still won't be for me, but you're not going to get very far without the 1.75u right shift and 1u FN that most 60% boards have - it's so common I'd go as far as to say the 2.75u could go in the 100% kit. your going to want to include a 1.75u shift in there its kinda standard now day's for most custom boards... 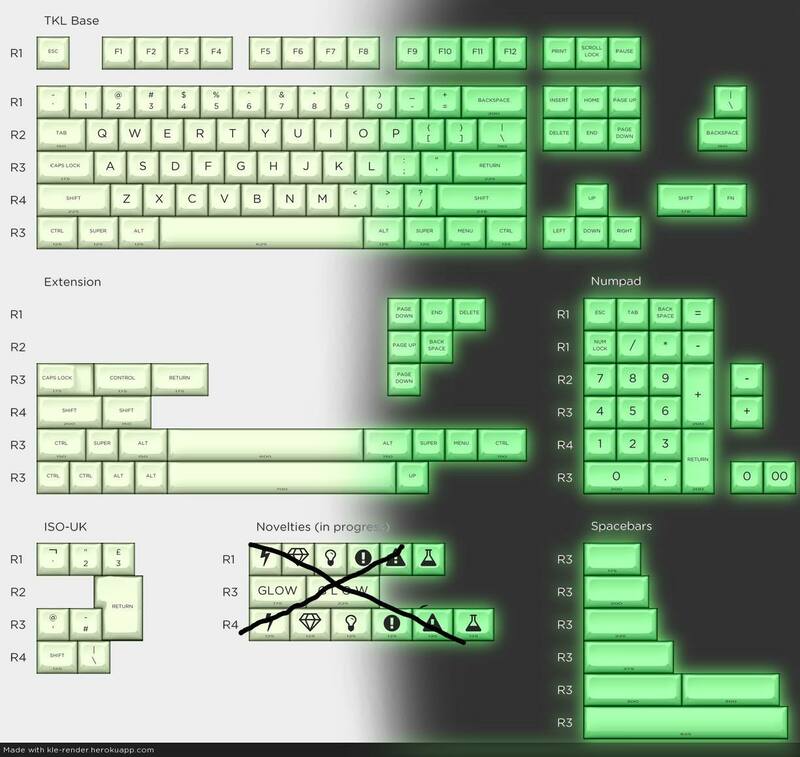 I am not even fan of SA at all but ... this is so unique I buy into it if the price is right just for the fact its Glow in the dark.. how flipping cool is that seriously my inner child nerd is screaming right now. I hear you on the 1.75. I'm not much into 60% so I'm likely to miss some subtleties. I'll update. I'm not ruling it out ISO - there's a chance if there's enough support vs. doesn't put off too many people. Can you elaborate on the 1u/1.5u mods? alt/win/ctrl? ISO is a lot of caps, it often fails to meet the minimum quantity separately on big GBs and ANSI people (quite reasonably) complain if it's included in the base set. And non ISO-UK users want their keys not UK ones... It's just a mess so unless lots of people request it it's not worth a second thought. One thing you gotta consider with layouts is are you prepared to potentially lose money with moqs and such. Will new molds have to be made? Etc etc. Also keep in mind MK will be a lot cheaper than SP. Backspace is for people that make mistakes. OP has to wait for SP to finish their sculpted PBT tooling, there are no new molds here. MaxKeys does ABS doubleshot only, so their pricing is irrelevant. Hope this goes well OP. Not an SA fan, but I love me some GiD! Will buy for the Diamond Supply-esque novelty alone. Very interesting idea too, definitely interested. You know my obsession with GID won't let me sit this one out. I'm in for just about everything that will be offered. On the Upgrade kit you've got [=] and [END] and [BkSp] keys there, but you've already got an [END] in the nav cluster. Two Ends? Seems unnecessary. edit: You've also got an [ESC] in the upgrade kit, but there's already an [ESC] in the 60% set. No need for two of those. I would recommend supporting the other common-ish bottom rows for those who don't use the 1.25 mods and a 6.25 spacebar. 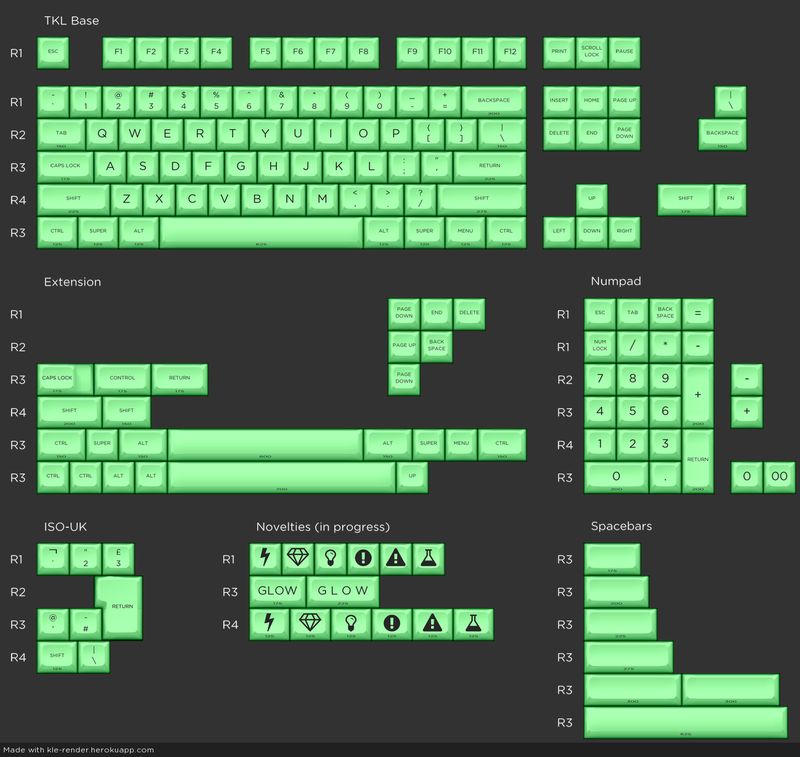 Basically, supporting a Tsangan set and maybe throwing in a 6x spacebar for the HHKB's/gaming keyboards would be very kind. Some 1.5u keys, some 1u mods as well, a couple spacebars... I'd suggest to offer it as a separate set and if it doesn't meet MOQ, it doesn't meet MOQ. As stated, 1.75u + 1u right shifts are pretty common on 60% boards (both of mine do that) so I think it would be wise to include them in the 60% set along with the 2.75u rshift. The most I was going to do was throw in a fatty enter and a couple blanks, however as you say that would be too much for the ANSI contingent to swallow, and not enough for any of the ISO posse. I'll give this a ponder but I'm keen to limit to (2) sets. This is not intended an epic Carbon/Space Cadet set, keeping it simple. 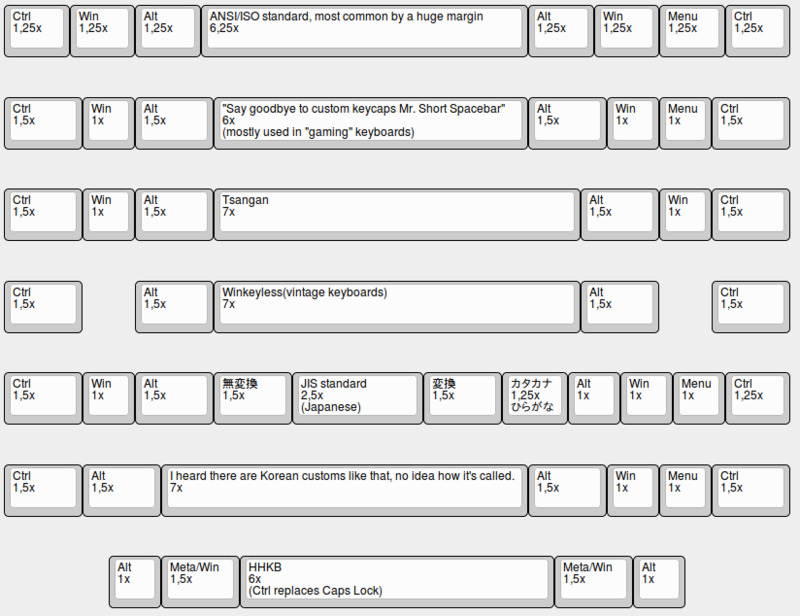 I guess this needs some clarification: [=] is indeed in place of [numlock]; [backspace] is because I use a lefty so I swapped [insert] with a [backspace] near the numpad on the left [See also expanded point/response below]; totally agree - the layout pic are progress so not fully tarted up with row info, these will come in the coming days. My wording in the OP was a little off - as Oblotzky says, it's tooling not moulding, my bad. These are not new moulds. To directly quote SP "We are working on completing new SA PBT sculptured tooling and hope to have it ready for production in a month or so. At that time we will start accepting orders". As far as I can tell GitD keys are dye-subbed so unless the material is extraordinarily expensive, this shouldn't be breaking any new ground. I threw the diamond in as a placeholder, but I'm digging it too though I don't tend to be interested in novelties! Full disclosure: novelties may not make the cut, I'm on the fence, though I guess a few can bring in more interest. To be honest I would have thought a full GitD set would be low hanging fruit and done already. Let's see how this one goes, fingers crossed. - It's my funky nav cluster arrangement for rational layout, and to compensate for my left hand nav/num clusters being away from the top right [BkSp]: [Hm] and [End] are arranged horizontally and either side of [PUp] and [PDn] which are in the middle because this makes sense to me, and a [BkSp] in place of [Ins] for left hand numbering as the traditional [BkSp] key is on the other side of the keyboard from the nums. 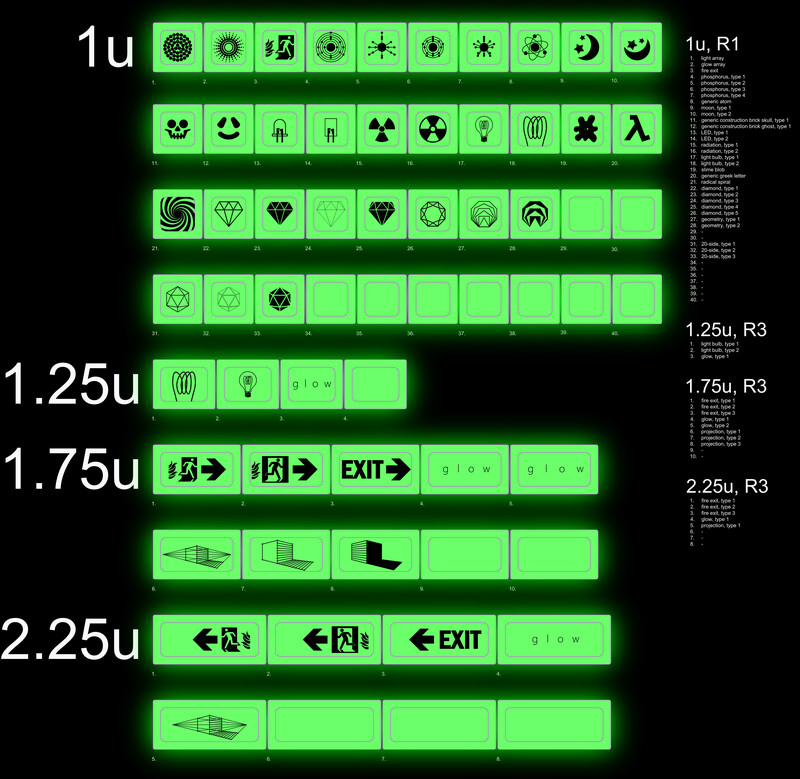 The former needs an R1 [End], the latter a R2 [BkSp]; These aren't fixed, but I thought "what would I do if I were designing my own keycap set?"
. It's my own personal conceit. The two [ESC] is an error, I didn't equate top R1 with second row R1. I'll update. - This was raised above - I'm trying to limit bloat and complication so needs a hard ponder, but I'm feeling a little allergic to accommodating anything beyond 6.25 spacebars. That's 7 different use-cases for perhaps 7 different people total, and I'm a sucker for single standards. As you say, maybe a third "PitA" set, where I can put my 3u spaces in! - Hearing this loud and clear. On the shortlist. SUMMARY: the big item seems to be non-standard bottom rows, though as they're dye-subbed (I still need to verify this 100%) this may not be as painful as if it were a double shot set. IN other news, what's the best way to get layout images together - I've obviously been using keyboard-layout-editor which needs cropping of screen caps/snip tool which is a little clunky - is there a better and prettier way? I understand wanting to avoid set bloat. 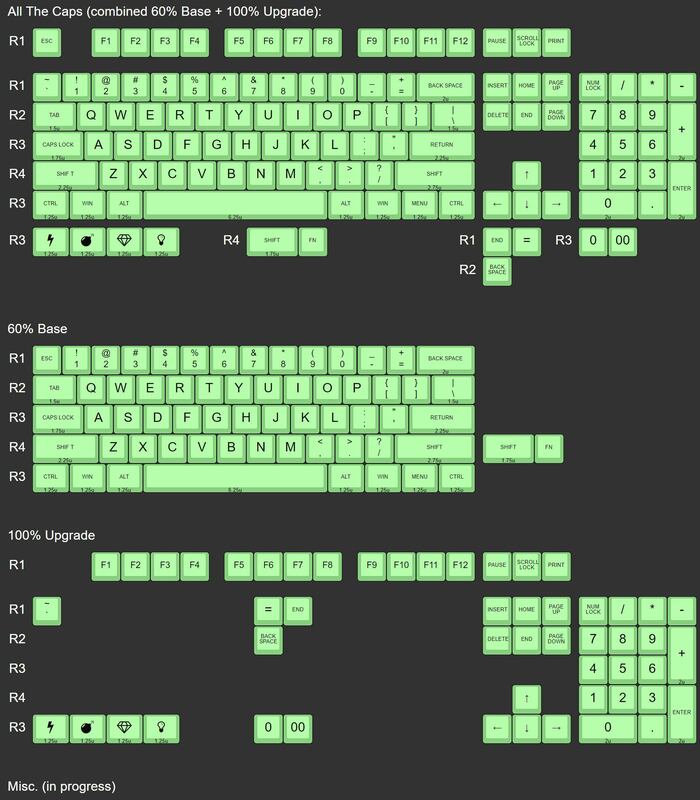 I respect whatever decision you make, because having the standard 102 key layout available is going to make most (certainly not all) people completely happy. If I can make a suggestion though, this tai hao set on massdrop has a very nice amount of flexibility across just 5 kits. It could be worth modeling this GB after. 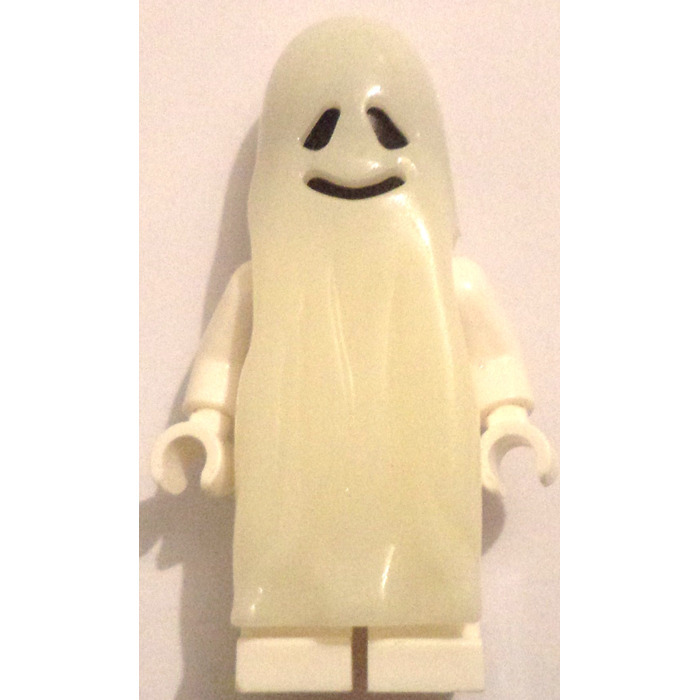 edit: Also, I have ideas for novelties, but one that came to mind this morning is a skeleton face, based on this classic LEGO, which got a GID head version in 2012. What is more a celebration of childhood awesomeness than LEGO anyways? A PitA extension set may happen, if only for my precious 3u. I'll get my best people on this. 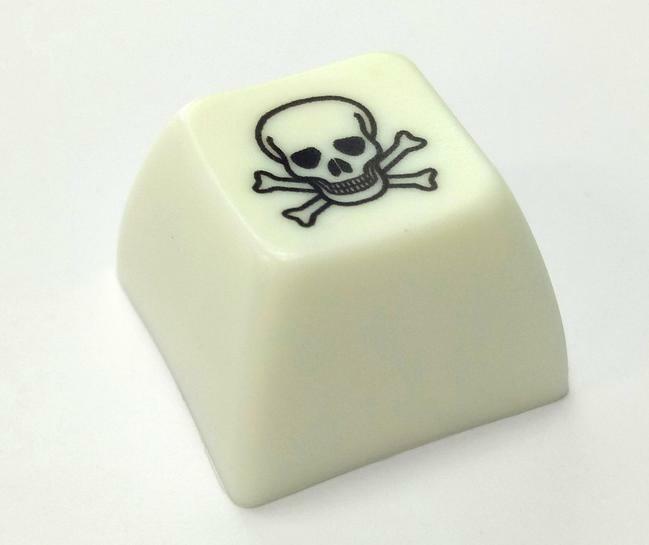 The skull is a little close to the Poison cap SA already have (in the OP), both of which are a little too hallowe'en-ey, but if it makes your inner child giggle isn't that what novelties, and indeed GitD, are all about? Also testing the forum's Glow effect. Ooh, nice. I vote for one set instead of a 60% then a 100% add-on. 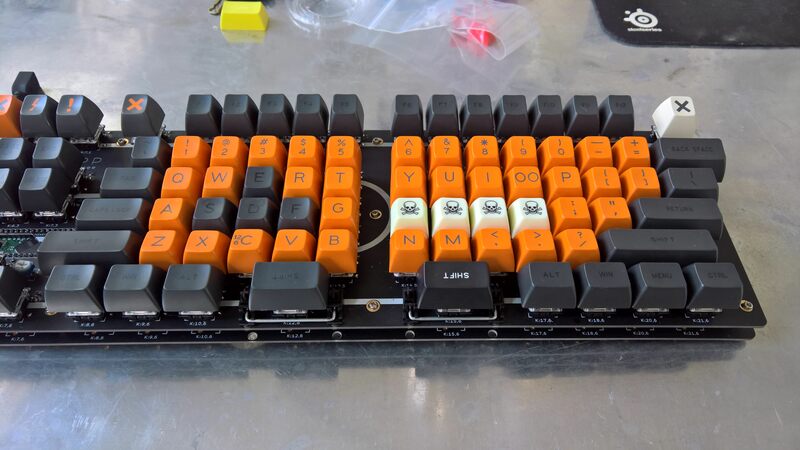 I'm on board for a 40% kit with 2.25, 2.75 space bar, 1.75 enter key. The current setup of 60% Base + 100% Upgrade is intended to meet you two in the middle. If I were to have it all my way I would go with a full set menu with all caps in one set, but some people want a la carte, which is why we are where we are. I'm considering a separate spacebar set. Sweet Jesus thank you. I love some split spacebars. Calling all the squeeky wheels tell me what space bars they'd like: I'll update a running list in the OP. You have to promise to get in on the group buy, mind. What monstrosity uses a 1.75u [Enter]? If it's in place of [Caps] I can get behind that. Otherwise your chances are not looking good. 6u, 7u, 2.25u and 2.75u are the most common I think. If you wanted to get saucy with it an extra two 3u caps would serve boards like the Banana Split. amj40, jd40, probably a whole bunch of 40% keebs. I can understand wanting to break the kits up for MOQ but one thing to keep in mind is. The risk of running the kits apart is the fact 60% might meet MOQ then the 100% doesn't then people turn around canceling 60% kits because what good is it if your not getting the 100% you need for your other keys. Then neither meets MOQ I think that why people use TKL as there base with a few addon's. Just something to think about! Now that's an interesting scenario. Though I'm not sure how a TKL base helps mitigate this if, say, your aim is for a 100%. On the flip side, the number of people who want a full size will help get the specials into play. Can any of the groupbuy organizer veterans chime in and give their take on last-second cancellations? Meeting MOQ (a number still TBD) on the 60% and not the full would be a shame. Also to those mostly interested in the 60%, would the full set only discourage you from buying? What's the logistics/risk scenario with a 60% and a Full Set look like? One thing you could do is run it ala GMK. ... is what I nearly ended the post with. Set menu, no substitutions, digestif is extra. Or guac, depending on your cultural touchstones. I want just alphas and a numpad so any particular 60%/100% division doesn't change which kits I buy; unless 40% support is added as a separate kit, in which case I'll get that, too. The reason I say a TKL or even 100% base helps mitigate the risk is due to the fact you will cover more boards. What I have seen of group buy's that's the biggest hurtle covering as much as you can for as cheap as you can. Also you have to make sure you play into your target market. While 60% are very popular I would argue that TKL and Fullsize board's still dominate the majority of desk in the world. Followed by 60% and then odd layouts like 75, 40, etc etc.. I think you really want to cover that target market. Throwing the 60% and 100% kit together your now covering pretty much everyone. There can be a misc addon kit to cover the odd ball stuff.. but the MOQ will be far easier to meet. But I mean me personally and sure others would feel the same way. I see a 60% kit offered as the base. I am going to be a lot more hesitant to buy in because I know if my add on kits don't meet MOQ then I gotta cancel.. and depending on how thats done could be a mega hassle for all parties involved. There will also be people who wait till the last moment to buy in cause they don't want to tie money up into a group buy until there sure MOQ is meet that will help with that also. I'm not sure if I'd like SA profile, but the uniqueness of this intrigues me. If the price is cheap enough, I'd be interested. I'm surprised there isn't a planet or star or moon novelty. Failing that, this would still be too appealing to pass up. this needs to be a novelty! This is awesome. Sign me up yesterday! 400+ strong and growing everyday. Also keep in mind MK will be a lot cheaper than SP. Yeah, for really really good reason. Maxkey has SP’s throwaway molds, doesn’t pay anyone for any QA whatsoever, and doesn’t fix their errors when they screw over entire GBs. I have ideas. Sometimes they're even good ideas. 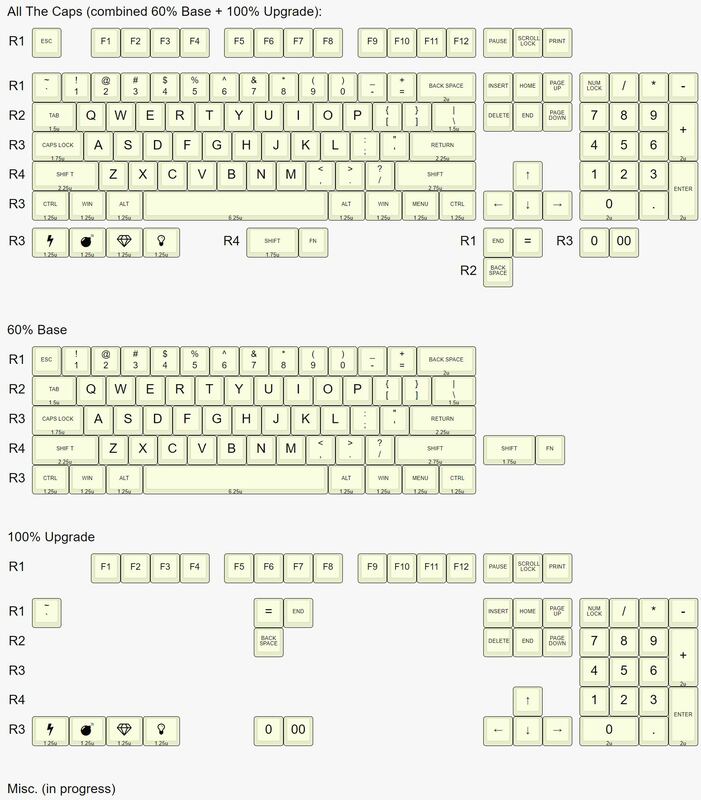 Overall I don't think this is too much to ask for in order to add support for 65%, 75%, 96key, 1800, and lots of boards with slightly odd bottom rows. 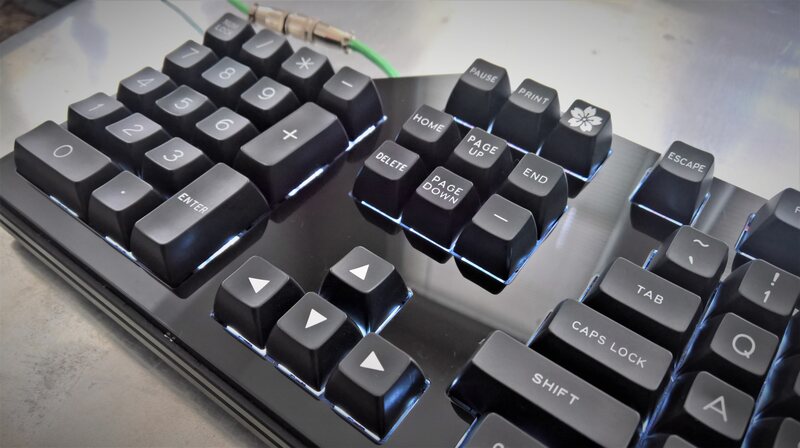 You could even toss all these keys, the split shift, and the extra 1u R1-3 keys you currently have in the base kit into a separate kit if you would prefer keeping the base streamline. I believe this would substantially increase the demand for the set due to the increased compatibility and layouts covered. In progress, when I've had a chance to digest the thousands of special case requests. Tongue in cheek I'm calling it the Snowflake kit. 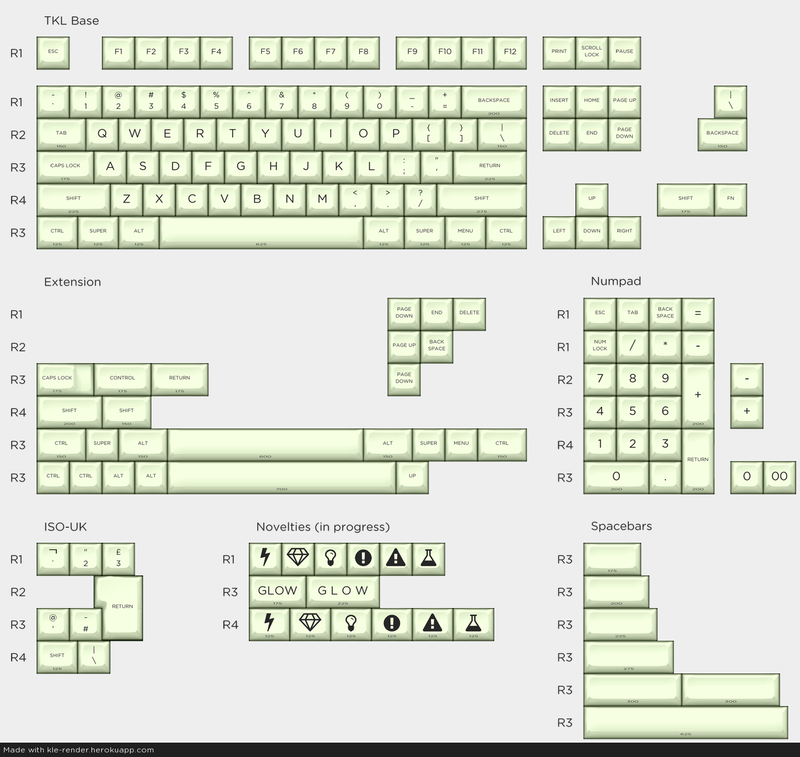 Depending on how cluttered the "Snowflake" kit ends up, I wonder if it might be better overall to have a Blanks kit that would provide the same or more coverage with fewer keys, especially since that blank Row 2 and Row 4 keys can be reversed. Blanks better serve the 1u caps - it's the wider caps which are causing the consternation, esp. the spacebars. Please do not do blanks for rather basic layouts, that's almost as bad as no support at all and is just overall lazy kit design. Also are we doing scoops or bars? Page created in 0.126 seconds with 77 queries.